Wandering through the maze of the USC Thornton practice rooms in the University Gateway apartments, you pass budding violin quartets, pianists and oboe players alike, all practicing intently. Laughter emanates from beneath the door of a small corner room, along with the low strum of a bass. The door opens, revealing a group of students sitting in a jagged circle, as they discuss strum patterns and time signatures, try out vocal riffs and blends, joke around and spontaneously jam out. Meet the pop band “sisters,” as band member Ella Collier lovingly calls her bandmates Elon Wertman, Jack Severino, Liza Kaye, Matthew Sukert, Raivyn Hearne and Ryan Mitchell. After a few days into their Popular Music Performance class, each of them was asked to form a band with six complete strangers from different sides of the country and with unique musical backgrounds. After eight weeks, this group of seven would be expected to publicly perform as one cohesive unit at Tommy’s Place. Needless to say, Thornton’s Popular Music Program starts its students off with quite a task ahead of them. Each week, a different band member would take on the role of MD, or music director, and lead the group through a set of assigned songs to be performed and judged by their professors. So the pressure was on to collaborate fast. The wide variety of backgrounds and tastes makes this group so unique while posing the challenge of coming up with a blended sound together. How did they go from being complete strangers on opposite sides of the country to becoming a musical family that trusts each other artistically? This is the story of Band 3. Click on the cards below to learn more about each band member’s musical background, and how it factors into their group as a whole. Liza’s musical journey began with her family and played a large part in her college education. Liza said R&B greatly influenced her musical style. “I go for definitely more of an R&B sound, Frank Ocean, a little bit of jazz influence but definitely on the R&B route,” Liza said. After playing for a while, Jack had the opportunity to speak with legendary guitarist Carlos Santana, after his mom, then a music industry publicist for ABC, set up a meeting. Santana solidified Jack’s newfound interest and helped him realize it as a passion. Jack notes jazz composer Marcus Miller and Canadian rocker Geddy Lee of Rush as some of his largest musical influences. The most important facet of his sound is having a mystery ingredient he calls “the sauce” but also making his sound smooth by checking in and collaborating with the drummer, Matthew Sukert. Jack’s main focus is his audience, especially how the bass makes people feel when they hear it. “I chose bass because it makes people dance, and it feels good, and when people hear good bass players, they just want to get up and move,” he said. Elon’s story is slightly different than his bandmates, as he’s pursuing music production rather than performance after college. This class fulfills an ensemble requirement for his major. Production students are tasked with being involved in two courses where they are involved in performing, which led him to pick up his guitar again for this course. For Matt, his obsession with the drums began when he was about 3 years old. It never did. At the age of 13, he was fully committed to pursuing music. He cites a wide range of influences on his own sound: Matt thinks that part of being a good drummer is just being exposed to and playing various types of music, from mambo to funk to rock. Ryan embarked on his musical journey with his older brother. Their father was a musician, and the two boys, who are both now in USC Thornton’s Popular Music Program, used to play around with their dad’s recording devices when they were about 7 and 8 years old. From there, the brothers formed a band that performed around the LA area. Ryan went to the Orange County School of the Arts, where he studied commercial music. Chris Sampson, the founding director of USC Thornton’s Popular Music Program, came to OCSA one day to teach a master class, where Ryan was exposed to the possibility of Thornton. And here he is, alongside his brother. Despite the fact that her entire family has always sang, Raivyn can trace her passion for singing back to the exact moment when she was 5 years old, sitting in from the television. Raivyn would describe her personal style as very soulful. “R&B, totally like Tony Braxton, Brandy fan,” she said. Ella’s love for music began when she participated in musical theatre at a young age. Then, at the age of 11, she began writing her own music and putting it out on iTunes and Spotify. She says she aspired to be like Taylor Swift and soon fell in love with the idea of being a professional singer/songwriter. She would describe her musical style as bold above all else. “Amy Winehouse-influenced, probably, and sassy and passionate,” Ella said. The group sits in a circle together inside a small practice room in Gateway. They seem like a close-knit family, but in reality, this is just the beginning. They’re still getting to know each other and their musical styles. Hailing from Texas, Georgia, California and New Jersey, each of the students come from very distinct musical cultures and backgrounds, from country to blues. But much like in the industry where they plan to enter in the future, they learn about their craft by collaborating with each other. In the beginning, it was hard to find that sweet spot where they all felt comfortable sharing and mixing ideas. Jack said in those first weeks, they would all learn their own parts separately and meet up to put them together. Four weeks in, they were still largely practicing in their own space and creative mindset before coming together to try and mix things. Matt explains how the process of learning to collaborate musically went. For him, the biggest takeaway was learning how to give constructive criticism to band members kindly. There was never a question of how hard members were working, but the communication necessary to bring that hard work together cohesively posed the greatest challenge. The way that they all work together has a lot to do with the way that the class is structured. Each week, the students explore a decade through a set list of songs, performing them for Thornton faculty members and receiving feedback. As they build this vocabulary each week, they also switch off holding the position of MD, or musical director. Some of the MD’s responsibilities include booking practice space, coordinating practice times with the band and sending practice recordings to Professor Andy Abad. It’s pretty intense how they breeze through this vocabulary. 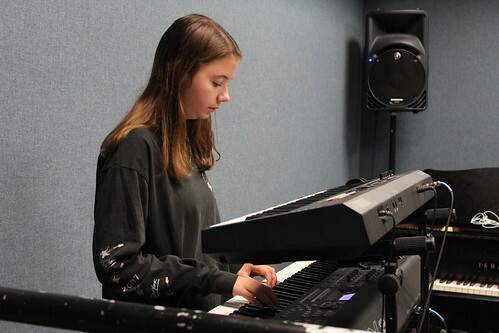 Each week, the students are given a new set of songs to work on, practicing two to three times a week outside of class and attempting to mimic the original version with their bandmates. 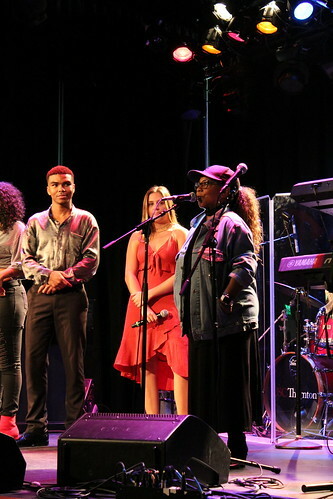 And this all has to happen in time for a weekly performance evaluation in front of legendary staff members, such as Professor Patrice Rushen, a four-time Grammy-nominated composer. And with this greatness comes a boatload of responsibility. From learning parts to blending them together, the band members have to rely on each other and collaborate to be successful. For Jack, finding this blend was a process. He realized throughout the process that his role in the band in many scenarios was not to be the center of attention at all times, but to let the singer take the spotlight and keep everything “tight” in the baseline. He also found that the MD position made a big impact on the mood of the band: when Ella took the position, he felt as if the group was reminded of why they were there: for the love of music. As the weeks go on, this blending becomes easier. The band members begin to tune into the frequencies of the other instruments and work as a group. “It’s starting to grow into something where we’re more of a band, and we’re more cohesive, and we’re starting to listen to each other’s parts a little bit more,” Jack said. The dynamic of the group has changed so much since the band began. The members seem to interact like a family, giving each other constructive criticism and encouraging each other to keep working. During a rehearsal break in a Thornton studio, they play “Johnny B. Goode” by Chuck Berry at a breakneck pace. By the end, Elon is thrashing his mid-length blond hair from side to side, Jack is strumming his bass intensely from the comfort of the floor and Matt is keeping debatably the fastest time ever on his drum set. Raivyn shakes a small metal instrument vigorously from side to side, while Ryan’s words run so fast, the tune resembles a rap. Friendships have formed, making the band stronger. Although the work is difficult, they seem to have more fun with it, really tuning into the other members and adapting as needed. 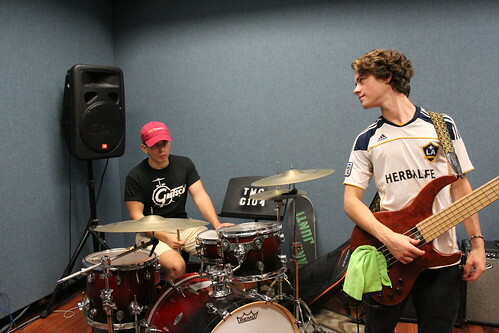 For Matt and Jack, their friendship outside of the rehearsal room helped them form a connection that both believe is essential as bass and drum players: they both had a common goal of keeping the beat tight and helping the rest of the band feel the rhythm. Coincidentally, they had met briefly at the Thornton welcome luncheon before being put in the same band. Living close to each other Jack had Matt over to see his studio setup at his apartment, and the two began recording together and formed a close bond. “Matt’s my guy, Day 1,” Jack said. “It’s like a love story,” Matt said. “I think the biggest, most important things for a bass player and a drummer is to be good friends before you get on stage and play some grooves,” Jack said. As the midterm comes closer and closer, the pressure rises in the practice rooms. But the band members never lose sight of what’s really important. “I just want to grow, regardless of whether that’s at a personal level [or] a professional level, [in] wisdom and musicianship,” Raivyn said. And the sentiment is shared across the board. Two nights before the midterm, the band is back in the studio rehearsing. Refining the details and applying notes, they seem to be much more of a cohesive team compared to their first rehearsal in the second week of school. They play off of each other, and despite the stress, they end up inevitably smiling during every song as they get in the zone. For Matt, the midterm performance was definitely a point of pride. They had rehearsed much more than was required, and felt ready to take the stage by storm when their time came. Matt said the band had three to four rehearsals each week, plus soundcheck, leading up to the midterm performance. Even without a legit rehearsal schedule in the beginning, everyone pulled it together for the big night. On the day of the exam, the energy in the room is slightly nervous, but overall electric. It says that they’re ready. On the night of the showcase, students mingle, greeting their parents and talking with their classmates under the low lighting of Tommy’s Place. Elon used to shake out his nerves before playing guitar, but he was calm and collected when it came time to perform. For him, this whole process is a little different. Elon’s journey to the stage is not one of a guitarist who’s always performing, but of a producer becoming immersed in a different aspect of his craft. After he accidentally recorded an EP in his senior year of high school, he realized that music production was the path for him. 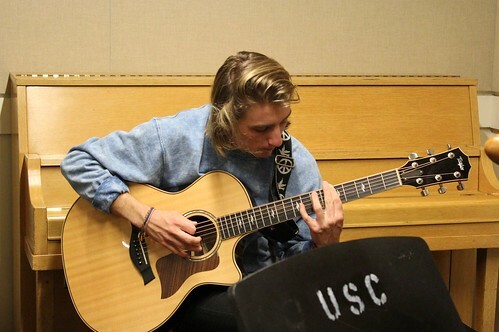 He had a fear of playing guitar in front of people prior to high school, which he slowly got over by the time he came to college, but playing for others constantly was still something that he was getting used to throughout the process. Band 3 huddles backstage before the big night. They briefly talk with Professor Abad, giving each other a nod of security before walking up the steps. Once the group hits the stage, everything evens out. They smile, they jam out, they enjoy themselves and the experience as a whole. Each seems confident in the songs, and reach a point where they can just enjoy the music and performing for the crowd. As they exit the stage after their approximately seven-minute set, high fives and hugs are in order to imbibe the feeling of pride. After countless hours of rehearsing, perfecting and practicing their music, the midterm performance is over. They finally did it: They actually became a band. And just like that, it’s time to move on. In the next week, they’re split into different bands, moving on to studying Motown music. But Band 3, their first band, will always be their first family in the Popular Music Program. It was their first time taking seven different people from seven completely different musical backgrounds and creating their own sound that will last long after the lights go out in Tommy’s place. Correction: A previous version of this feature had Weeks 1-5 labeled as Weeks 1-4 and Week 7 as Week 6. The change was made at 2:52 p.m. on November 15, 2018. ZaZu is a freshman pursuing her B.A. in Public Relations. An Annenberg Media journalist, ZaZu is also a singer/songwriter, dancer and choreographer on the side. She is the founder and creator of By ZaZu Lippert, a creative site that produces artistic content as well as planners. To view her full portfolio, visit https://byzazulippert.wixsite.com/home.